Being a designer, who likes numbers, and working in a newsroom, the emergence of a “new” branch of journalism under the banner of ‘data journalism’ was bound to pique my interest. 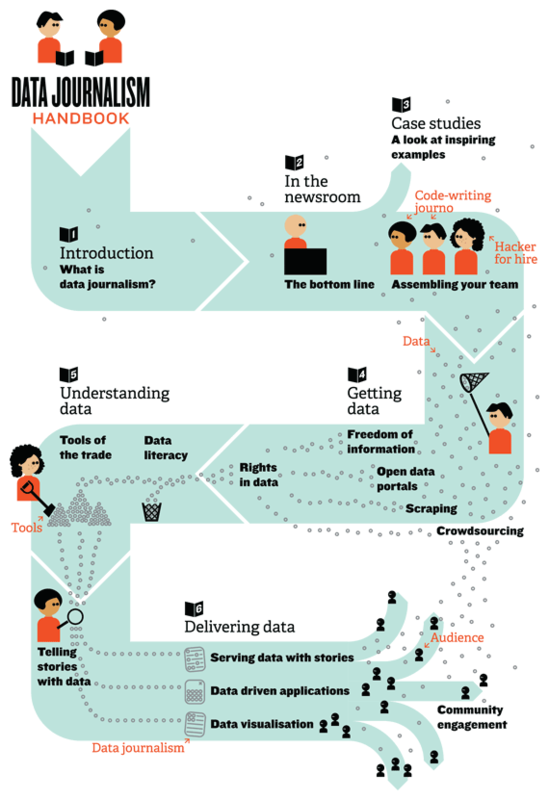 I designed the poster for the launch of the Data Journalism Handbook two years ago and since then I’ve given a couple of talks about data journalism. And while it’s taken until now to summarise them on my blog I think the key points are still valid. According to IBM 90% of the data in the world today has been created in the last two years alone. This data is generated both offline and online, by individuals as well as businesses and organisations. It contains a record of actions, opinions, connections and interests. Not all of this data is being used, but it exists. If the goal of journalism is to inform people about the important issues of the day how useful would it be to be able to harness this data? Potentially we now can ‘see’ into the workings of individuals and organisations, events and phenomena by looking at the data that describes them. This is data journalism. While ‘Data journalism’ is being bandied about as a new thing it’s actually more a case of data being a new weapon in a journalist’s arsenal. Whether data is the tool used to find stories or to tell them it’s just playing a part in the process of journalism. A selection of case studies can be found in the Data Journalism Handbook that give more detailed examples of the following benefits of data journalism. Data provides new ways of finding stories. Analysis of an original dataset, or an existing dataset but in a new way, can lead you to a story no-one else has found. Data also offers new and richer ways of telling stories, giving the reader a better experience: let them explore the data themselves; make the story personal to them as an individual; serve a story relevant to their town or region. In the same vein interactive data presentations lend themselves well to sharing on social media, and engaging readers in conversation. You can tap into the readers’ experience, expertise and opinion. Equally you can get the audience to contribute their data, crowdsourcing further new material. With data journalism having its origins in publicly available data it is incumbent upon data journalists it to pass this openness and transparency on, sharing their data and methods. In so doing any insights gained from data are verifiable: other people can check, replicate or challenge findings. Using data in journalism in this way not only reinforces the role of journalism that serves the public interest but it also is a factor that has the potential to increase the public’s general level of trust in journalism. With such massive potential for original journalism emerging out of the increasing volume of data out there, there is a tangible spirit of innovation. This goes hand in hand with the potential all things digital have injected into journalism. In a world where the consumer can now choose when, how and from where they get their news, trust and insight are two attributes that can get journalists heard above the general noise. And both of these can be provided by the use of data in journalism. Beyond journalism there is a data market place made up of both not-for-profits and commercial companies providing and selling data-sets, analysis and visualisations. However it’s not yet clear how news organisations fit into that. What is certain is that there’s no shortage of data. This combined with the fact that the analysis of it is getting cheaper and easier and better is good for journalism. It provides a new tool to help deliver better reporting in the public interest, be that in the finding or telling of stories. But it’s worth remembering data is just a tool that can be used in journalism so there’s little point trying to pin down a separate business model for it. There’s more mileage in focusing on journalism’s place in a digital world, and identifying where the use of data can play to its strengths, providing value for audiences. And that’s looking like being in the areas of trust, experience and community.